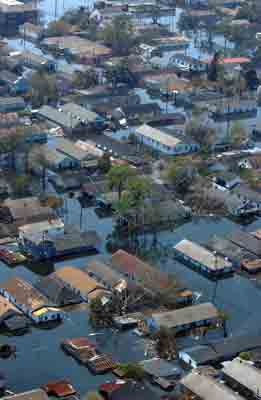 A flooded neighborhood in New Orleans six days after Hurricane Katrina hit Louisiana and Mississippi. Chapter 1 of The AMS Weather Book opens with the experiences of the National Weather Service (NWS) meteorologist who issued a dire warning of Hurricane Katrina’s effects on the New Orleans area the day before the storm hit. His experiences and those of his extended family illustrate how anyone living anywhere that a hurricane could hit should prepare for and respond to a hurricane watch and warning. Katrina’s devastation of New Orleans was no surprise; many organizations and individuals had been warning of the danger for many years. The resources below will help you learn more about both what Hurricane Katrina did when it hit and what scientists, forecasters, and emergency managers knew about the likely effects of such a storm. NOAA’s Hurricane Katrina Web site has links to information about the storm’s meteorology, forecasting, and its effects. 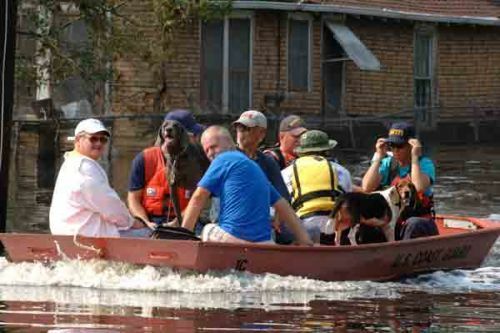 A U.S. Coast Guard boat transports residents and their pets from their flooded New Orleans neighborhood a week after Hurricane Katrina hit Louisiana and Mississippi. 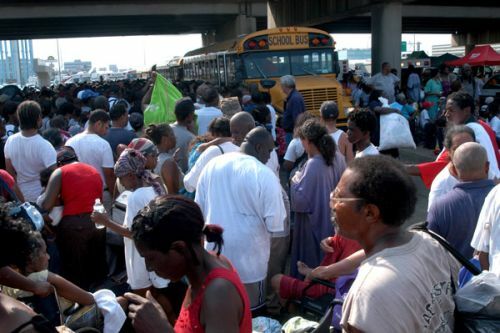 Evacuees wait to board buses to take them out of New Orleans the day after Hurricane Katrina hit Louisiana and Mississippi. The National Hurricane Center’s (NHC) report on Hurricane Katrina, Abbreviated Tropical Cyclone Report: Tropical Depression Ten (PDF file), is a meteorological summary of the storm written after the end of the season.